I grew up in southeastern Pennsylvania and even went on to play college football up there. If you have met me, you probably wouldn’t believe that, but let that be a testament to the power of eating plants! It was actually a pretty scary sports injury to my neck that first got me into a chiropractor’s office. I have her to thank for encouraging me to become a chiropractor upon hearing I wanted to spend my life helping people somehow. So, I ended up down in Atlanta, GA attending Life University’s doctorate program for four years. Those years changed my life in many ways. First, I learned how intelligent the body is. That it is our friend, not our enemy. I learned the power of foods from the earth and I met a beautiful woman who I am marrying this April! Megan is to thank for bringing myself and my practice to Knoxville. I also spend most of my time outside the office hiking, so the Smokies were a major selling point. Knoxville also has my heart the more I witness the holistic wave that is building in this city. My plan is to ride that wave with you all as a trusted leader and resource and most importantly, supporter and encourager. The most remarkable truth I have learned along my journey is that the body is a self-healing organism. The body’s intelligence is magnificent. Every day in my office, I remain in awe of its wisdom. Sometimes my patients try to give me the credit for healing their bodies, but I have to remind them their body is the greatest doctor they have! So, what do I do? You may know there are normal ranges for blood pressure and body temperature, right? 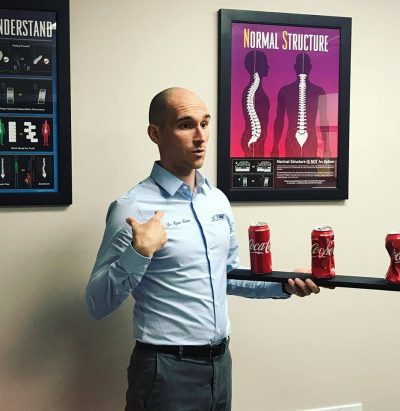 Well, did you know there is also a “normal” for healthy posture? Right now, do you know where you are compared to normal? There is a universal law that structure will dictate function. Look at when a car goes out of alignment. How well can it do what it was designed to? When structure is altered, the function cannot perform at 100%. Same with your body. When life forces your posture into an unbalanced, off-center and compressed position, do know that it impacts the functions of your body? Those very functions that are in place to keep you healed, healthy and THRIVING! So, if you feel your body is not functioning as best it could, having a structural chiropractor look at you is a smart place to start! Summit Chiropractic is the only chiropractic office in Knoxville that has a Posture IQ device that accurately and objectively tells your posture’s story. We also bring a GENTLE and SPECIFIC release technique this city has not seen before. The body does not require anything added (force) to it, but rather help releasing what is not serving it (tension). So, in our office, you will never hear me say I adjust anything, rather I release tension. I offer complimentary consultations to anyone looking to learn more about my approach and if I can be of service to them. Why? Because at the end of the day, I am here to MAKE SURE this community knows they have options when it comes to their healing. That is exactly why it brings me great joy to say I am a practitioner member of CHEO and support them in doing the same.